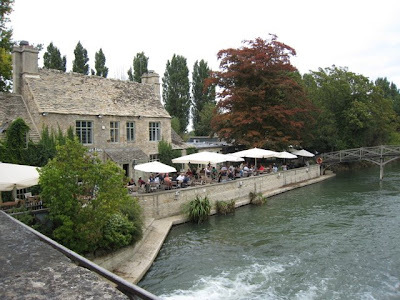 There are so many great pubs in Oxford, it was hard to choose a favorite among the 8 I reviewed. The Trout (above) has everything I look for in a pub: history, properly stored bitter (beer), real wood fires, cozy nooks, good food, country walk, pleasant outdoor seating and a peacock. Okay, I don’t usually look for peacocks, but this one came looking for me! Book a table days ahead for dinner at The Trout. Stick to the pub classics like the best fish and chips or special savory pies. My kids adore the wood oven pizza. The hummus etc. plate is good for sharing. Perfect with a pint of Landlord’s. Sitting outside by the river, watching the sun set over Port Meadow, is bliss. You can get a full tea too. Colin Dexter (creator of the Inspector Morse series) is a fan of The Trout as were other local authors. I’ve never seen Dexter at the pub, but I have passed him on the road while picking up my daughter from school. The best way to reach The Trout in Wolvercote from Oxford City Center is on your wellies (rubber boots). Take the dog too! Enter Port Meadow from Jericho, and you have a nice 4 mile loop along the Thames/Isis River with The Trout at midway. 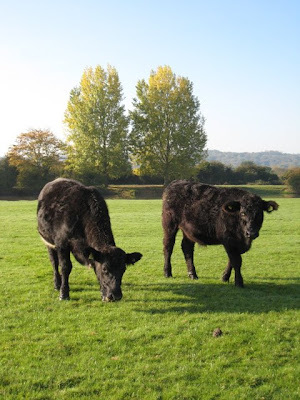 The Port Meadow side is a muddy, boggy field with horses, cattle, geese, swans and migrating birds for company. 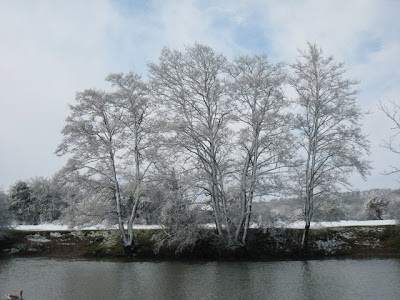 It’s gorgeous in a frost or the rare snow. At the north end of Port Meadow, cut through the car park, take a left on the Godstow Road and cross the bridge. Pass a sheep farm on your left and a community garden on your right. The Trout will be on your left before the next bridge (about 5 minutes). On the way home, take a left, cross the bridge and turn left onto the Thames towpath by the Godstow Abbey ruins. At the end of the towpath, cross the footbridge back to Jericho. If you don’t have wellies, you can take the towpath both ways. The less intrepid can take the Number 6 bus from Oxford City Center (near the Randolf Hotel) to Wolvercote Home Close (end of line.) You’ll have a 10 minute walk down Godstow Road. The Trout has a good size car park too, but then you’ll have to watch your drinking. Really! I live in Wolvercote. My English husband chose our house because it was closest to his favorite pub and country walks. The Bear is tiny and authentic (1242!) During term time, crowds spill into the road. 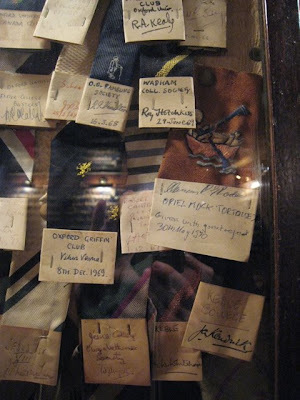 Wear a special tie only if you are willing to have it clipped for the impressive collection housed in glass cases on the walls and even on the ceiling. The most classic but hardest to find pub is The Turf Tavern. Check out their website for funny visual directions or you'll never find it. It’s cozy inside and has plenty of outdoor seating in the courtyards. 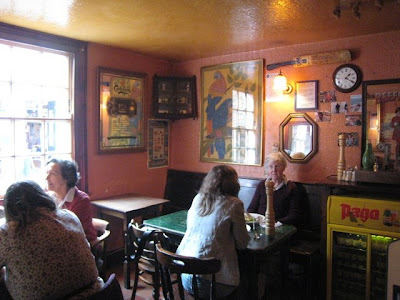 The Turf has been a favorite Oxford watering hole for centuries. It was mentioned in Thomas Hardy’s Jude the Obscure. The Lamb & Flag was also cited in Jude the Obscure. It’s popular with students and is owned by St. John's College. The lamb and flag signify that saint. The visual signs were key in old pubs, serving an illiterate community. I had an excellent pint of Pewsey Best, and Henry’s half of Spitfire was good too. Okay, I’ll own up. I ordered the Spitfire (half pint as we were visiting 2 pubs) and traded it for the Pewsey because it really was the best. Research, darling. Great atmosphere at The Lamb and Flag. I wonder if they ever light the enormous fire? It was almost cold enough. April has been miserably grey and bitter with the exception of yesterday. Yes, I know you are wearing T-shirts in NYC. It might get up to 75 here – in mid summer! 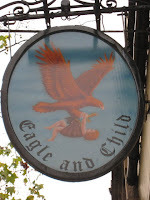 Across the busy road is the most literary pub: The Eagle and Child (1650). C.S. Lewis, J.R.R. 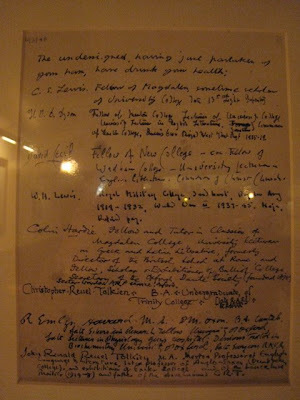 Tolkien and other friends met every Tuesday morning(!) between 1939-1962. “The Inklings” discussed books and their writing. They called the pub affectionately “The Bird and Baby.” Is the sign creepy or what? 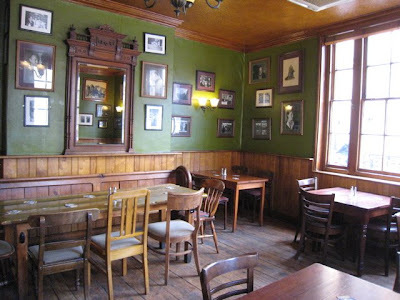 On the walls are pictures of the famous writers, a framed letter to the landlord and even a commemorative plaque. 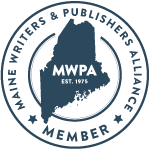 Hey, my writer friends and I occasionally meet at Henry and Marty’s for a drink and dessert back home in Brunswick, Maine. We discuss writing, revising and publishing too. When’s the plaque going up? Sitting in the Inklings’ corner is Henry, my best drinking buddy. He knows from pubs. The Brakspear (local Oxford brew) was divine and the Adnams Broadside was good. Add a packet of crisps (potato chips) and you’re sorted. 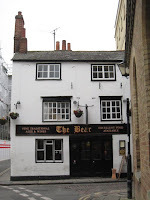 Looking for a big, easy to find pub? Go to The Kings Arms, smack at the end of Broad Street near my favorite bookstore, Blackwell’s. It draws a lot of tourists and students. The food isn’t so great, and I find the high ceilings lend a cavernous feel. Smokers on the outside benches and traffic fumes waft inside. For you Oxford locals, this is all old hat, so I’ll name a couple of favorites more off the beaten track. 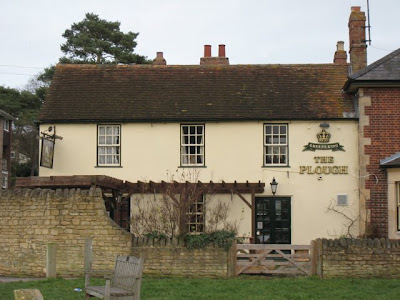 Perhaps the most obscure good pub in Oxford is The Plough on Wolvercote Green. Take the Number 6 bus, get off at Wolvercote School, walk straight past the school and down the hill. The Plough is on a meadow by the Oxford Canal with limited parking. You can also walk a couple miles to it from Oxford Center along the canal towpath. There is pleasant outside seating in the meadow (for those of you with dogs,) also an adjacent playground. It feels like a country village pub. 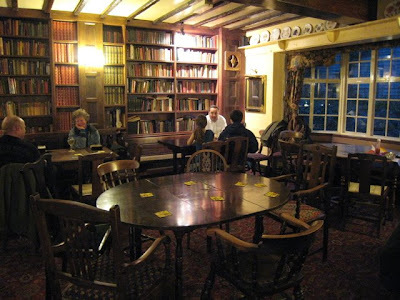 Sit in “the library” at The Plough. There's a working fire (gas), huge bay windows and lots of books. My daughter enjoyed reading J.H. Williams’s In Quest of a Mermaid (1960) while waiting for her kids’ menu dinner. My teenaged son loves the fresh chicken burgers. The food is really good value. I once had a delicious ostrich steak special, and they prepare fresh side vegetables. The Plough’s food is not as tasty as The Trout’s, but you can always get a table and it’s much cheaper. Go there if The Trout is full or just for more peace and quiet. The Abbot Ale was mighty fine and the service very friendly. The Plough and The Trout are the best pubs for families or for a meal. Avoid the two other pubs in Wolvercote by the end of the bus line. The Red Lion has bad food and lots of loud kids playing in the bouncy castle. Give The White Hart a miss unless you fancy a wide-screen TV playing the football (soccer.) Don’t confuse it with The White Hart in Wytham which is good for a pint, although the food isn’t as good as it used to be. Closer in to Oxford Center is The Rose and Crown on North Parade. It is a 20 minute walk from Oxford Center and a good value for okay meals. I hear the ale is kept really well but didn’t sample it as I was working after lunch. Yes, I’m still revising my novel, S.A.D. I'll be back for a pint of Old Hooky, a local brew and favorite of mine. 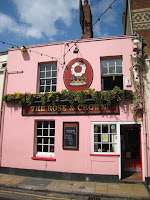 The pink color both inside and outside was cheerful, and I saw more women at The Rose and Crown than at the other pubs. What I love about English pubs, is that they are friendly places for women and even families, not at all like American bars. The English beer is cask temperature so you can really taste it (like fine red wine.) Lager is light, and bitter is darker. My favorite bitters are medium amber colored, smooth and rich like Hobgoblin. It shouldn’t be cloudy, too hoppy or sour – that happens when improperly stored or too old. Riverside at The Trout for sundowners. Pubs are often the social hubs of villages, but sadly many are going out of business due to the cheap cost of beer in supermarkets, high taxes on pub beer, stiff penalties on drunk driving (that bit is good!) and perhaps the recent smoking ban passed last summer [as reported in The Week April 18.] 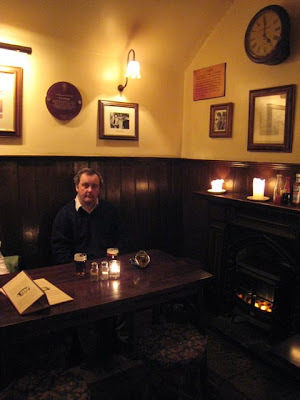 I for one much prefer pubs since the smoking ban – I’m going much more frequently now. You can expect several pub scenes in my English novel, Not Cricket (A Match for Eve). 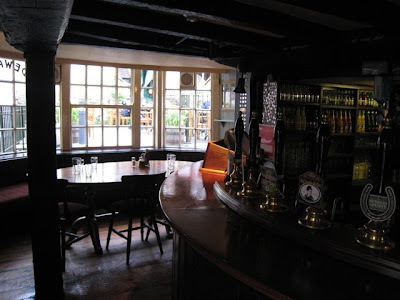 If you know of other good pubs in Oxford, please add a comment below. Click on the “pubs” label to read more reviews. Cheers! Great blog, a real trip down memory lane. I haven't been back to The Turf for years. 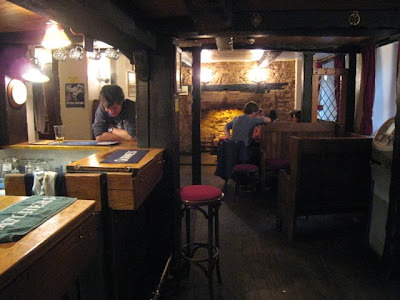 You should try the pubs in Jericho, The Stonemason is pretty good. I enjoyed your tour. 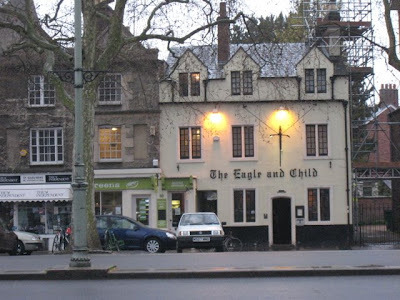 I've been to The Bear and The Eagle and Child. I'll have to bookmark the rest of your suggestions for the next time we're in Oxford, probably for Brasenose's 500th anniversary. I am so pleased that I live close enough to sample some of the fruits (hops?) of your research. It must be lovely for Henry to come back to Oxford and find his old haunts still humming. I am particularly intrigued by The Trout -- especially with the built-in calorie-offsetting of the four mile walk. It sounds like a good day out for the American friends and family. I know that you aren't a tourist -- and in some ways, not even an expat -- but there is something lovely about knowing an experience is limited time-wise. It does help one try to pack in as much as possible, don't you think? Thank you for the lovely and informative tour. I hope we have a warm summer -- so that I can enjoy some sundowners! Ruth, you are a cheap date and great company! Hey Jude (Jay?) pay my respects to Thomas Hardy, and watch your old back laying those stones. It isn’t often that literary characters comment on my obscure blog. There is, of course, no Stonemason Pub in Jericho, but there is a pub named after you. Mss, my cheers to Brasenose on its 500th! Watch out for the door knocker during the festivities. Bee, our American visitors loved The Trout for the English pub experience. Enjoy! I am trying to pack as much as I can into my remaining 3 months. Call it novel research or fun. This was an interesting tour - it made me realise that I've heard far more about pubs in Cambridge than I have in Oxford. 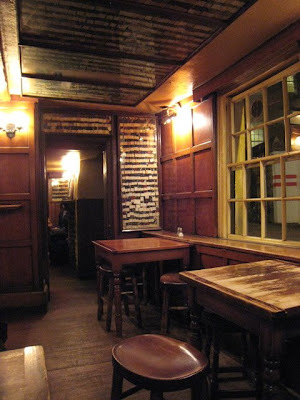 Several of my law school classmates went on to study at Cambridge and probably spent more time in pubs than in classes. We just had our first visit to the Trout last week and it's our new favorite. It helped that the sun was shining on our warmest day in Oxford yet. Thanks for the great suggestions. So many pubs, so little time. I like the Vicky Arms. I stumbled across your blog while researching places to visit on a return trip to the UK after 10 years in Australia. I loved taking a trip down memory lane - as I visited all of these pubs and more while growing up in this area. Oxfordshire is a truly beautiful place. Thank you so much. Sunday evenings at the Half Moon is definitely worth a stop after hitting the locals. The sessions there can be quite brilliant and a perfect conclusion to a well spent Sunday afternoon hiking about the trails of Oxford. Kate, Deb, Anonymous Commenters and Robert, thanks so much for your suggestions! 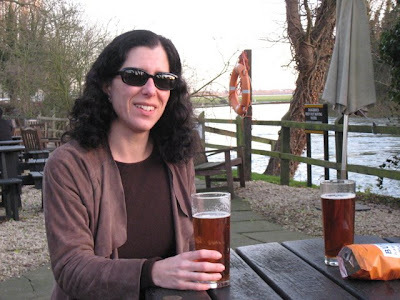 My Oxford Pub review has remained my second most popular blog post for seven years, right after Expat Tips for Sabbatical in England. I return to Oxford most years when visiting family. My husband and I shall be back for another sabbatical at Oxford in 2017, and I'll enjoy checking out your suggestions. I'll post an update on my blog.